Are you committing any of these innovation monetizing failures? One of the companies I worked for is a startup that made 3D goggles for medical applications at the start of the millenium. Better than anything that was on the market then. How cool is that for doctors – being able to actually stand inside a patient’s body and have a real look see? Unfortunately this was a classic startup failure. The two brothers started the company, with their father as financial backing, with a lot of techy know how, but no business know how. They looked for partners to help them commercialize. Their first investor fleeced them. Their second partner ran away with crucial copyrights. And then they found out nobody was willing to pay for their invention. Innovation and commercialisation need to go hand in hand – before the first prototype is launched you have to ask your potential customers: what would you be willing to pay for this? Companies are face increasing downward pricing pressures leading to job losses and cutbacks. The consumer goods business is particularly vulnerable, with giants such as P&G and Walmart feeling the pressure (see WSJ article in references). An overwhelming majority (83%) of C-suite executives surveyed by Marketing Week (see references) reported they were facing increasing price pressure. Most companies (77%) plan to innovate themselves out of this dilemma with new products, services, and business models. Feature shock – too many features in one product, that are unwanted by customers, creating overpriced solutions. When a company attempts to create products that are ‘all things to all people’ they often find they are ‘nothing for nobody’. This failure typically occurs in product driven or engineering cultures. A good example is Amazon premium smartphone which was launched in 2014, and included 3D dynamic perspective, mayday technical support, firefly and plenty of other features. It launched in July 2014, at $199 with a two year contract and just four months later it was cut to $0.99. Minivation – when a company innovates the right product for the right market, but price it too low to achieve full revenue potential. This most frequently occurs in risk averse cultures, where they are more concerned with adding a markup to the component costs to make the product, when they should be looking at the value the components add, and what the customer is willing to pay for it. Playmobil launched Noah’s Ark in 2003, they sold out in just four months, and then customers started selling it on ebay for a 33% markup on the price. Hidden gem – these are the potential blockbusters never properly brought to market. In traditional business cultures there may be a degree of ‘core business coddling’. Kodak got clobbered in the digital camera arena. Ironically Steven Sasson had invented the technology behind digital cameras, but it threatened core business film, so Kodak didn’t launch their first digital camera until 1995, and didn’t get serious about it until 2001. Kodak declared bankruptcy in 2012. Since 2015 they’ve been trying to resurrect their business around their patents. Undead – innovation customers don’t want, wrong answer to right question or answer to question no one was asking. This failure often occurs in top-down, discouraging feedback cultures. The Segway, hyped as a breakthrough, personal transporter, was priced much too high. Google Glass was an undead product for a target audience who already had a smartphone. These four failure mechanisms have common ancestry – the culture of the organisation. Innovation needs the right culture. Failure to include your customers in your product development process leads to a product nobody wants. What new concepts, processes or products have you developed in the last two years? How did you know it was the right product? How did you know it was the right target audience? 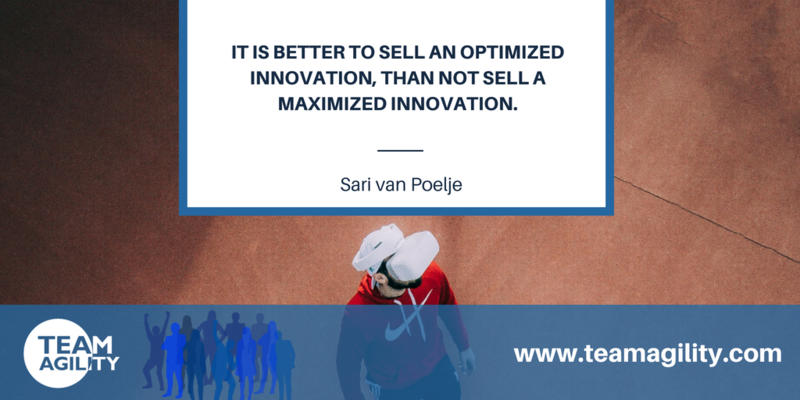 Sari van Poelje has 30 years experience of innovation on the interface of leadership and organizational development, executive coaching and transactional analysis both as a director within several multinationals and as an international consultant. Specialization in creating agile leadership teams and business innovation! She is the author of numerous articles and books on leadership and change.